Here’s a cute little article called 14 Reasons I Don’t Wear Shoes. I think I can help her out in one area. As I said, it’s a nice article. The author pretty much gave up on shoes a few years ago, and, with help from Daniel Howell’s Fact Sheet from his Barefoot Book, made her own list of the reasons she doesn’t wear shoes. I like being connected to my environment. Going barefoot requires me to be more alert to my surroundings, and being able to feel the surfaces under my feet naturally encourages an enhanced awareness of my surroundings. As a result, I’m actually less clumsy without shoes. I trip and stub my toes much less often. It’s a nice list, and I encourage you to click through and take a look at it. But there was one area she mentioned she didn’t see going barefoot. Every year I become more convinced that shoes are completely unnecessary in most circumstances (except, I think, in sub-freezing temperatures and while performing certain kinds of labour. Like, say, using a shovel. I haven’t managed to do either without shoes). I can help her on the shovel thing. Actually, they did decide to change the name to ToolStep, which is much better. Their web page has a link to where you can get one. But . . . but . . . but there is something wrong with that picture. Of course. When you’ve got a boot like that, who the heck needs the ToolStep??? I have one, given to me by Greg Morgan, lead hiker of the Ohio Barefoot Hikers. So, here is what it looks like when being used by a barefooter. It actually works pretty well. 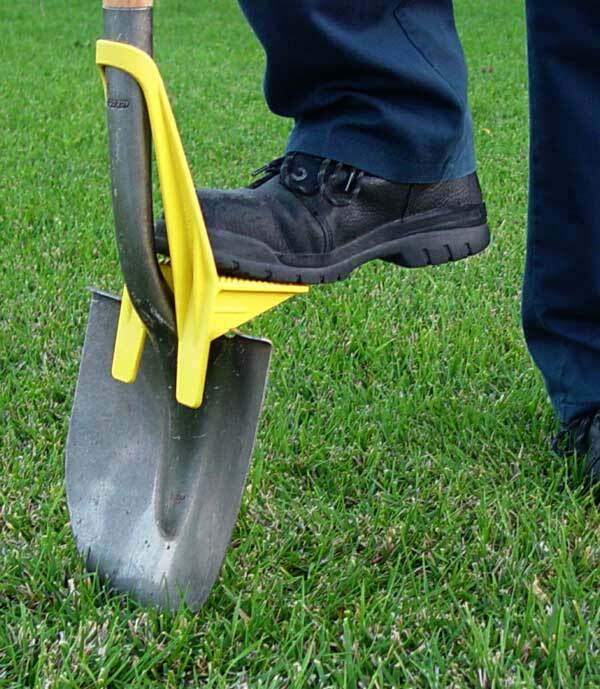 Occasionally it tries to twist around the handle of the shovel, so it does take a bit more care than just stomping down on the shovel. However, of course, the extra care is more than worth it to be able to continue to be barefoot. Here is one more photo from the other direction. So, the problem of barefoot shoveling: solved. Hi Bob! Thanks so much for the link and the kind words! And thanks for the suggestion! I love working in my garden and would like to do a lot more of it. I hate trudging inside to put on shoes just to use my shovel. This sounds like a handy tool for those situations! I was, of course, just trying to point out that there are probably certain situations where shoes are necessary, but those situations are rare. Just because they exist, though, doesn’t mean we ALWAYS have to be wearing shoes, just in case such a situation arises! Thanks again, and I love the blog! Hooray for fellow barefooters! 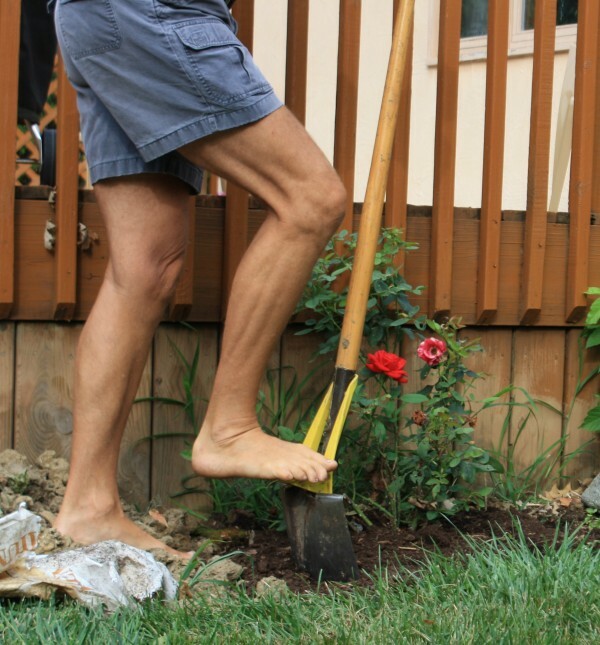 I have a method for using a shovel barefoot that has allowed me to dig several holes with no problem, even through soil that was partly building rubble. I simply use the shovel diagonally to hack and twist into the soil and loosen it up. This is what I used to do when I still wore shoes as I was never able to get them to work the way they are pictured working while I was growing up. 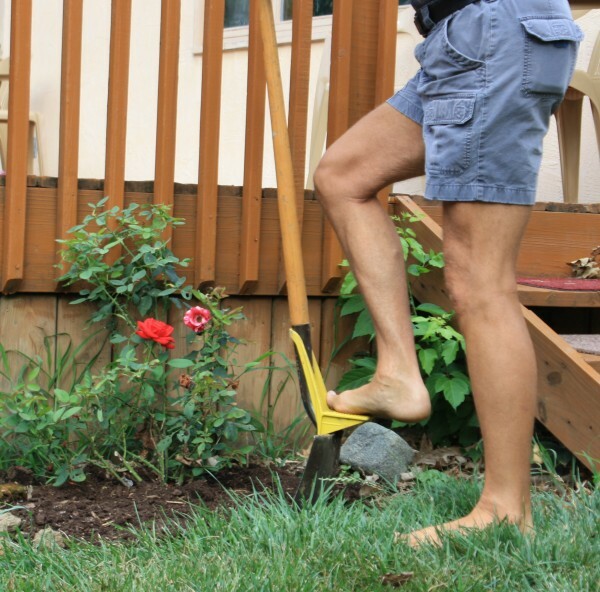 I find that if the soil is soft enough that stamping down on the shovel cuts into the ground, you can do it barefoot. I find that placing my foot on shovels which have that curve at the top is panless enough for me to handle barefoot shoveling. In fact, I’ve never even seen shovels that don’t have this curve, unless it’s been torn. Just this year, I’ve dug about a dozen holes in the ground for four raised beds, barefoot and I didn’t need the TrenchFoot. I can use a shovel or pitchfork without this device. It’s never really posed any kind of problem. Shoes are evil,shoes were created by Satan ! ! ! ! I grew up in Miami back in the 60s when kids went barefoot all the time even had a job when I was in high school working Summers driving a boat and they didn’t require shoes at the yacht club I worked at . Now I’m retired and I work several days a week at a motel by the beach and they don’t care if I go barefoot or not so I am lucky enough to have several days a week where I can just totally go barefoot. I absolutely hate wearing shoes and I love it at the beach. Can’t think of any time over the years when I had an injury to my feet. I wear flip-flops when I travel in an airplane just because it avoids confrontation but I do remember one time leaving the airplane and since I go barefoot so much I left my flip-flops in the plane and had to walk through the San Juan airport barefoot and nobody said a word. I find it is sufficient just to have flip-flops handy when boarding a plane. Most times they don’t even notice (or notice and don’t care). If they do notice, I put on the flip-flop until I get to my seat, and I’m Golden. When I exit the plane, if they notice (and it has happened), what are they going to do, throw me off the plane?! ?